The mission of the residency is to prepare optometrists to provide full-scope primary care optometry by providing post-graduate clinical experience beyond that provided in the Doctor of Optometry program. Objective: The resident will develop a high degree of efficiency in the provision of primary eye care services. Outcome: The resident will provide primary eye care services involving a minimum of 1400 patient encounters, 60% of which will include obtaining a case history, visual acuity, refraction, tonometry, and external and internal ocular health assessment during the encounter. Measure: The resident will report monthly on the number of patient encounters of this type using the patient encounter logs and summary sheets. Goal 2: Strengthen the resident’s expertise in the diagnosis and management of ocular disease. Objective 1:The resident will perform the appropriate diagnostic procedures. Measure: The resident will be evaluated quarterly by the supervisor to determine if the desired level of technical and cognitive ability is being exhibited. The resident will determine the best management based on the diagnoses. Goal 3: Expand the resident’s knowledge of specialized diagnostic procedures. Objective 1: The resident will develop expertise in interpreting optical coherence tomography (OCT) results. Outcome: The resident will analyze 100 or more OCT studies (anterior segment or posterior segment) during the residency. Measure: The resident will report on the number of patient encounters of these types using the patient encounter logs. Objective 2: The resident will develop expertise in interpreting visual field testing results. Objective 3: The resident will develop expertise in ordering and interpreting relevant laboratory or radiological procedures during the residency. Outcome: The resident will order or utilize the results of at least 40 laboratory or radiological procedures during the residency. Goal 4: Increase the resident’s knowledge of systemic diseases and their treatment. Outcome: The resident will coordinate care with non-optometric providers in management of patients with systemic disease. The resident will participate in relevant presentations and conferences on systemic disease. Measure: The resident will report monthly on the number of patient encounters and participation in conferences of this type using the patient encounter logs and summary sheets. Goal 5: Enhance the resident’s knowledge of specialty optometric care. Objective 1: The resident will gain experience in managing patients with limited sight. Outcome: The resident will manage 30 or more patient encounters involving patients with limited sight. Objective 2: The resident will gain experience in utilizing medically necessary specialty contact lenses. Outcome: The resident will manage 30 or more patient encounters involving the utilization of medically necessary specialty contact lenses. Objective 3: The resident will gain experience managing patients with binocular vision disorders. Outcome: The resident will manage at least 30 patient encounters involving the evaluation and management of binocular vision disorders. Outcome: The resident will present lectures during conferences and other meetings held at Southern College of Optometry and at the Dorn VAMC or area educational facilities and when possible will present posters or lectures in other settings such as the American Academy of Optometry and SECO. Learning Activity: The resident will provide primary eye care services involving a minimum of 1400 patient encounters, 60% of which will include obtaining a case history, visual acuity, refraction, tonometry, and external and internal ocular health assessment during the encounter. Outcome: The resident will develop enhanced skills in the management of primary eye care patients. Objective: The resident’s ocular disease-related diagnostic skills will be enhanced. Learning Activity: The resident will provide services to a significant number of patients with ocular disease and will formulate a diagnosis based on the results of the procedures performed. Outcome: The resident will become highly proficient in the performance and interpretation of basic and advanced ocular examination techniques on patients with ocular disease, and will attain advanced skills in the management of these patients. Objective: The resident will utilize specialized diagnostic procedures and instrumentation while caring for patients. Learning Activity: The resident will interpret ophthalmic fluorescein angiography, B-scan ultrasonography, anterior segment photography and relevant laboratory and radiological procedures. Learning Activity: The resident will provide eye care to a large number of patients with systemic disease and will consult with non-optometric providers in the total care of these patients. Outcome: The resident will be able to communicate effectively with physicians in the co management of patients who have systemic disease that impacts their ocular health. Outcome: The resident will be able to effectively care for patients with limited sight. Learning Activity: The resident will present lectures during conferences and other meetings held at Southern College of Optometry and at the Dorn VAMC or area educational facilities and when possible will present posters or lectures in other settings such as the American Academy of Optometry and SECO. Each residency is one calendar year in length, commencing in July. The resident is eligible for 13 days annual leave and 13 days sick leave which accrue at a rate of 4 hours annual and 4 hours sick leave per pay period with additional days alloted for educational leave. Health insurance is available through the VA at decreased group rates. Part of the premium is also paid by the Department of Veterans Affairs. A. The resident is defined as an employee of the William Jennings Bryan Dorn VAMC and the residency stipend is paid by the VAMC. No tuition or fees are applicable. B. The resident should apply for optometric license in at least one of the fifty states prior to the beginning of the residency. C. Professional liability protection for residents for work done at the William Jennings Bryan Dorn VAMC is provided under the Federal Tort claims act. D. Residents will have access to the Internet for research purposes, the Dorn VAMC and University of South Carolina Medical School libraries, and remote access to library search capabilities at Southern College of Optometry. A. The resident is required to deliver clinical services at a level that is satisfactory to the Residency Supervisor, Director of Residency Programs, and the SCO and William Jennings Bryan Dorn VAMC administrations. Normal clinic hours are from 7:00 A.M. until 5:30 P.M. The resident clinics operate on a compressed schedule with four ten hour days per week which affords the resident a week day off each week. The resident is expected to be present during all working hours, except attending conferences and doing study or research. The residents will share the responsibility of carrying the pager while in the clinic in order to address urgent eye problems. However, optometry residents are not required to answer calls during off-duty hours. B. The resident is required to keep a record of patient contacts. Cases will be reviewed periodically by the Supervisor of the Residency Program and the Director of Residency Programs. C. The resident is required to write a publication quality paper based on original research, literature review, or a clinical case. The resident will be encouraged submit this paper to an approved journal. E. The resident is expected to perform in a professional manner in the delivery of patient care services and to observe those proprieties of conduct and courtesies that are consistent with the rules and regulations governing William Jennings Bryan Dorn VAMC. G. Upon successful completion of the Residency Program, the Residency Supervisor and the Director of Residency Programs will recommend the granting of certification to the Vice President of Academic Affairs. H. Any resident accepted for training can be dismissed, without receiving a certificate of completion, for infractions of the rules and regulations of the William Jennings Bryan Dorn VAMC or those set forth by Southern College of Optometry, or for any action which jeopardizes the safety of patients, personnel, or physical facilities. A residency stipend will be provided for the year of training paid by William Jennings Bryan Dorn VAMC. The current stipend is $34,888. Compensation is not contingent upon productivity of the resident. Other employment (moonlighting) during the residency year is allowed by the Dorn VAMC optometry program provided that the resident does not let outside employment interfere with ANY residency activities and that such employment does not take place during normal working hours. Residents who choose to moonlight will not be allowed to leave their post at Dorn VAMC during normal office hours or before patient care duties are finished. Using sick leave or annual leave to work in the private sector is prohibited. The residency program at Dorn VAMC is fully accredited by the ACOE, 243 N. Lindbergh Blvd., St. Louis, MO 63141, 314-991-4100. The resident reports to the Supervisor of the residency program. 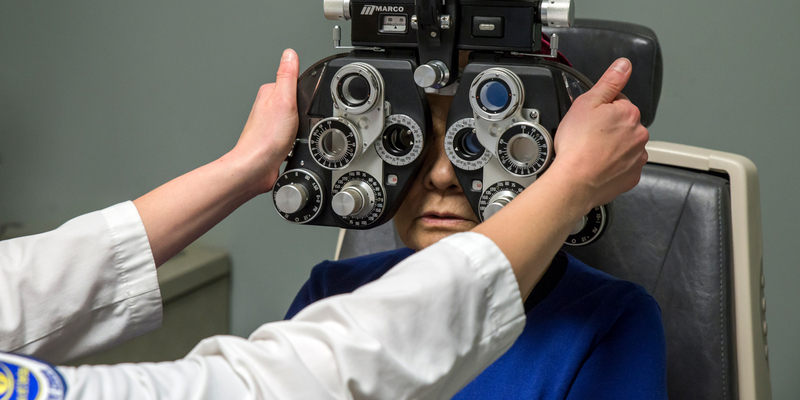 The Supervisor reports directly to the SCO Director of Residency Programs who in turn reports directly to the Vice President of Clinical Programs at Southern College of Optometry.